I've been discovering a lot of things lately. Somewhat physically and spiritually. Anyway, in that time, I've been doing a lot of research and listening on the theme Love. I've discovered that (in my opinion, the Greeks thought so too) there are three types of Love. God's Love to us, as his sons and daughters, especially towards his son Jesus. The Godly Love towards our brothers and sisters in Christ, also the Love between parents and children, basically family love. Last of all the Love between husband and wife. There are a lot of references for Love, 1 Corinthians 13 for instance. It's exciting because it tells about what Love should be, Godly love between God and his children and between our families in Christ and our biological families. The three basic examples for these are 1; Christ, 2; the church and 3; us! God's love toward his children, us is the greatest Love of all. But Christ is the greatest example of this Love, and because "God so loved the world, that he sent his one and only son, [so] that who ever believes in him, will not perish but have eternal life." John 3:16 God loves his children! The second is the church. We have love towards our brothers and sisters in Christ, and they can usually be found in the church. We are tied together as family through God, fellowshipping in the church while worshiping Him. And last of all examples, we have us! The sacred Love between husband and wife results in new life! Because "two shall become one" (not remembered reference...) :) We have had a lot of new life here in New Hope, three babies born in the span of three weeks! We have Hannah Mulungi (it means beautiful in Luganda), Genesis Karren (I've been told that's her middle name) and Rachel Alexa. Rachel isn't even 24 hours old yet! She was born last night at 8:40 to the Bouffard family. Praise God! Love is wonderful, isn't it? I want to thank God for a number of things. For bringing three new babies safely into the world and for bringing me through hardships (not many, so that's another thing to thank God for!). I also want to thank him for protecting Micah and I as we climb a 50 ft. tall mango tree (it is soooooooooo fun!) and thank you Lord for kittens that are growing really fast. Pray for us as we travel to Kampala tomorrow to the ARA (American Recreation Association) and to shop and pick up our new calico kitten, thank you for all the prayers for rain, we have received much, enough to mostly fill our cistern and help with the growing of our sweet corn and strawberries! P.S. 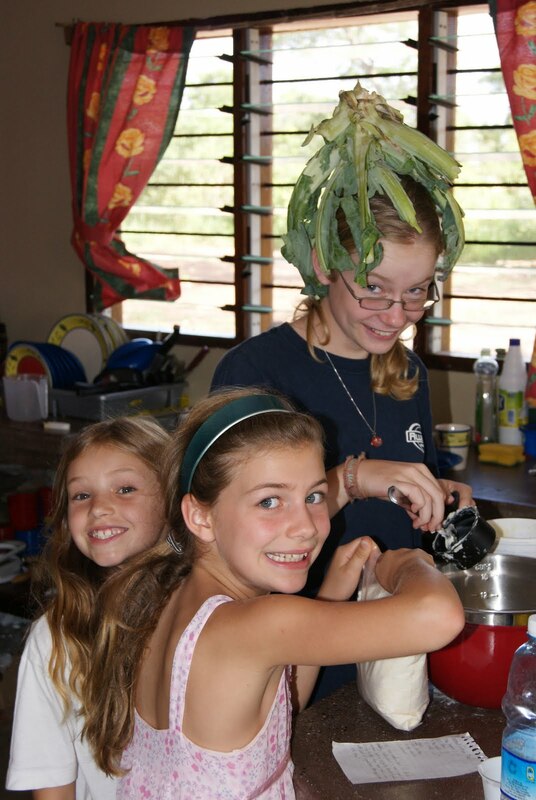 The two pictures are of our new cat Domino and me wearing a cauliflower stem while baking coconut cream pie with my friends Katelyn (front) and Acacia. That cauliflower was HUGE!! !